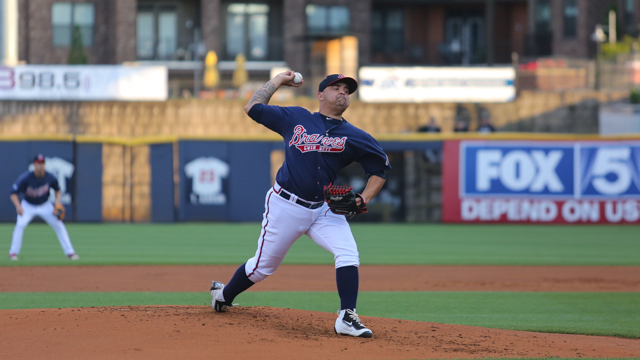 LAWRENCEVILLE, GA - Gwinnett Braves' pitcher Williams Perez has been named the International League's Pitcher of the Week for May 2-8. Perez made one start during the week, a 9.0-inning complete-game shutout in Gwinnett's 4-0 win on May 6 vs. Charlotte. The right-hander allowed only a walk and an infield single while striking out seven over the 112-pitch, 76-strike outing, his first career 9.0-inning complete game and shutout. It's the seventh 9.0-inning complete-game shutout in G-Braves' history and the first one-hitter since right-hander Chris Resop on June 10, 2010 at Norfolk. The 24-year-old Perez opened the season with the Atlanta Braves, going 0-0 with a 5.11 ERA over three starts before being optioned to Gwinnett on April 20. After going 0-2 with a 6.10 ERA over his first two starts with the G-Braves, he's now 1-2 with a 3.26 ERA. Perez currently leads all International League pitchers in complete games (2, also pitched a rain-shortened 5.1-inning CG on April 30 vs. Columbus) and is tied for first in shutouts (1). It's the first career IL Pitcher of the Week award for Perez, who made eight starts with Gwinnett on his Triple-A debut in 2015. He is the second G-Braves' pitcher to win the award this season, joining current Atlanta Braves' right-hander Aaron Blair (IL Pitcher of the Week for April 18-24). Gwinnett begins a seven-game road trip tonight with the opener of a four-game series against the Rochester Red Wings. First pitch at Frontier Field in Rochester, NY is set for 7:05 p.m. Right-hander Lucas Sims (0-2, 5.06) is scheduled to start for the G-Braves against left-hander Taylor Rogers (0-1, 4.91) for the Red Wings. Tony Schiavone will have the play-by-play on 97.7 FM at 6:35 p.m. The G-Braves return to Coolray Field on Monday, May 16 with a 7:05 p.m. game vs. the Durham Bulls. Tickets are on sale now at the Coolray Field Ticket Office, call 678-277-0340 or visit GwinnettBraves.com/tickets to purchase.